Diamond Necklaces Spoil yourself or someone special with a unique diamond necklace. 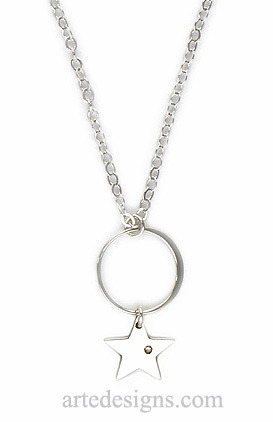 A sparkly, faceted, round diamond sits perfectly in this sterling silver shining star. Entire pendant with the round sterling silver link is approximately 1.25 inches high. Choose a 16, 18, or 20 inch sterling silver chain with a lobster clasp. Arte Designs diamond necklaces include rough diamonds in their natural state and small diamonds set in sterling silver. Rough diamonds are one of a kind and give off a hint of sparkle while preserving their raw, natural form. Chic and unique diamond necklaces you'll love to wear.